I like Hell's Vengeance, but I agree it has it's downfalls. 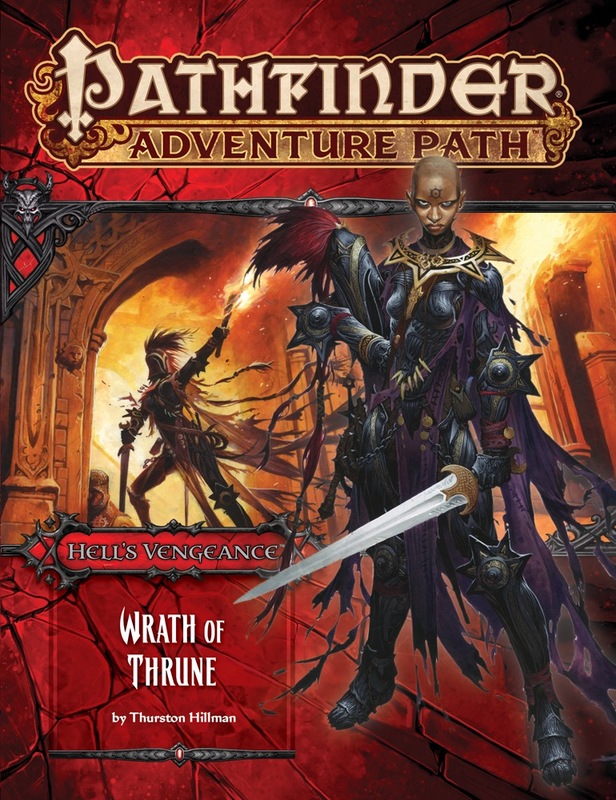 Wrath of Thrune, however, in my opinion, is a best part of it at realising AP's promise: playing as evil character. It's premise is relativly simple: there is a town captured by goody two-shoes's forces. Party are going in undercover. Objective is to destabilise the situation in town enough to recapture it. There is no bosses and orders, you are free to choose your aproach, as long as you're not bringing all the guards on your head. And here the fun starts. You have this town on plate, it's leadership, it's security forces, it's citisenship. You can unravel them all in many many delicious ways ranging from coy and silly like seducing one of the city leaders romantic crush to horrifyingly brutal. And there is much consideration about nature of rebellion and civil war. Glorious Reclamation are good and you are evil, there is no mistake in that. But as our good guys confronted with reallity they bring with their uprising: necessity to fight their friends who don't agree with their ideals, necessity to do something with captured prisoners, their confidence is starting to unravel. Antagonists are not "lawful stupid", but their idealism based on genuine good intentions can bring as many suffering in the world as all evil ambitions, which is very interesting and refreshing view on such a story. All in all, this adventure will require a lot of work from both GM and players, but it can be very satisfying. Sorry if my review have any mistakes, as English is not my first language. Sandbox adventure with unimaginative maps but solid enemies. The NPCs and enemies are designed very good and tough. The interior illustrations are cool. The 3 magical items are good. The maps are too simple. Kantaria is a bland settlement. The GM has to invest much time to customize this adventure to his group. The "Despair Meter" changes should be summarized more central but are all over the place. The motivation for the PCs to swear loyalty is not there beyond "just do it". Summary: While Thurston Hillman does his best (which is pretty good) to flesh out the adventure, the overall conception of the AP boxes it too much in. The Evil AP continues to be mediocre and could have been so much more, if the framework had been developed better. Hell´s Rebels has much better designed maps and cities. Edit: Obligatory, "We're all gonna die!" Still not sure how I feel about this one. 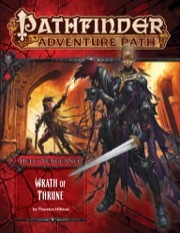 Wonder if this is where we'll be getting a formal write up of Abrogail Thrune II, a.k.a. Your Boss. Highly doubtful. If anywhere, I'd expect it in the Continuing the Campaign article in Hell's Rebels. How I'd love a write up of Abrogail and her Devil allies. Though if she's going to be a recurring NPC (your her employees, after all), I'd be surprised if she doesn't have a write up for Hell's Vengeance. WHY CANT I PLAY AS THE GLORIOUS RECLAMATION. By the end of this AP, you really won't want to. Secretly evil/morally compromised Glorious Reclamation makes me a feel a little better. Haha! For the glory of Asmodeus!! Death to Mitr-I mean, Iomedae! Psh...I would rather die as Ned Stark than live as Littlefinger. Woo hoo ! Aboot farging time for Thursty to move himself up in the world. It's hilarious I'm so interested in this AP for the fact that I despise the premise and want to know more about the antagonists. Any idea when the cover will be updated ? and the new Iconic unveiled ? I'm not entirely sure of the timeframe for this, but the reveal of the updated cover and the unveiling of the new iconic are directly related. Hopefully we'll have it up soon. Product image and description updated to final. como que eu faço para jogar tb..? How about living as someone outside of G.R.R.Martins book because all of his characters die. To be fair, everyone dies outside of books. You think Martin's bad at killing his characters? Try Shakespeare. Hell, try the bleeping Bible! The spirit of Death itself literally gets killed in Revelations! Also, does anyone know what this AP's bestiary features? Can't wait to get my subscription copy! What are the creatures in the bestiary? And what's the most evil, screwed up thing you're encouraged to do in this volume? Not yet available. Keep yer knickers on. Nope, shipments headed out yesterday (14th) and some people should already have their pdfs. So anyone want to start spoiling? 4. People in my group will laugh at the last four letters of that name. To clarify, #4 is a misspelling. Might want to tweak that, Brad! Don't suppose we could get some CRs attached to those? They reproduce by implanting polyps in the heads of humanoids, who then eat away at their host's brains. A lot slower and easier to resist than any Mind Flayer, but still, creepy. Another flying head monster and no myth monsters... Though the jellyman sounds interesting. What is the population of Kantaria? I tend to increase population statistics in my game, but that's the default number / spread.